Wendy Berry is running for city council in West St. Paul’s Ward 3. I’ve already explained why I’m voting for Wendy Berry, but I wanted to share the inspiring moment when Wendy launched her campaign. Below is the speech Wendy gave at the pivotal May 14, 2018 city council meeting. The room was packed with more than 150 people and the citizen comments went on for nearly two hours as residents condemned the sexist behavior of certain members of the council. This is the speech that launched Wendy’s run for city council. You can watch the entire speech online or read it below. Back in May, with a standing room only in council chambers, a line of amazing, strong women shared their experiences and their desire to see some change with our City Council. It was as that same time that I officially announced my intent to file for City Council for Ward 3. August 14th is the Primary Election and three months after this meeting. I'm so proud to have gained so much support and to see the level of engagement we saw at this meeting has only intensified. My wife and I bought our first home in West St. Paul a few years ago, we didn’t plan on landing here. We moved from North Minneapolis after considering Northeast Minneapolis, Southeast Minneapolis, St. Paul—sure we looked at a house in West St. Paul, but we weren’t going to buy it because we didn’t know it was a real city. [Now] we’re here and we love it, it’s our home and it’s become our community in many ways, ways I wasn’t expecting—especially in the last couple months. 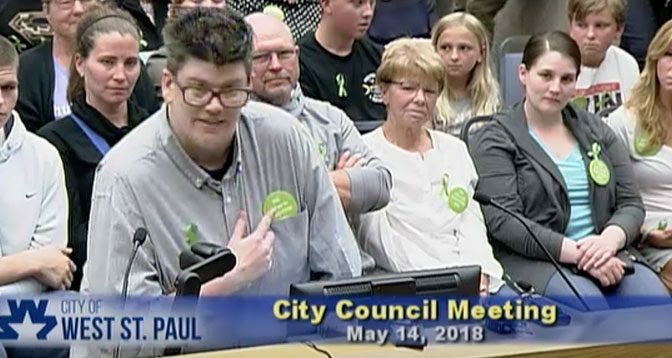 I attended my first city council meeting on May 1—it was the “special” one that was called for 9 a.m. on a Tuesday. When council members Fernandez (who’s not here) and Bellows were asked specifically by a citizen why Ward 1 didn’t have representation on the city’s Planning Commission, they both said they didn’t realize that was the case. They didn’t know that one out of only three wards didn’t have representation on that committee. Council member Iago wouldn’t answer any questions unless people met with him privately. … If the people of this city council aren’t taking into consideration something as simple as making sure three—and only three—wards are represented on these half-empty committees, then I have a hard time believing those same people are thinking about any other types of representation. I want the entire city council to take a look at this room, and tell me what you see—it’s not quite like looking in a mirror like you look in every day. The diversity and the richness of the people of West St. Paul is not accurately represented by our city council. We’re made up of more than what’s seated at this table. We’re women, we’re people of color, we’re gay, we’re lower to middle class, we’re homes with two working parents, stay at home parents, we’ve chosen not have children, we’re servers and line cooks, we volunteer as election judges and for animal rescue organizations, we’re renters, we work as machine operators, librarians, day care providers, middle management, some of us with more than one job so we can make ends meet and some with no job at all. In all the city council meetings I’ve read or watched I’ve never felt like the majority of this council represents me, my family, my neighbors or anyone like me. That’s why I’m here tonight. The amazing women who have stood up before me and described their personal experiences with a few of you—they’re offensive, they’re appalling, and they’re embarrassing as a fellow citizen of this city. This type of behavior isn’t the West St. Paul that I’ve gotten to know and it’s not very becoming of the people that have been elected to represent those that live here. It’s not welcoming and it doesn’t promote a community that I want to read about or watch in the media outlets that are catching on to this antiquated, old boys club mentality. I want to be proud to live in West St. Paul. I want everyone in this room and everyone who calls this city home to be just as proud. And people want to do that by volunteering—they want to help improve our park systems and make sure we have the right zoning ordinances set up to help our city grow and find ways to make our city more sustainable. The thing is, nobody really knows how to get on these half-empty committees or commissions. Nobody knows the unwritten qualifications or rules that keep getting made up on the fly behind closed doors. People keep applying over and over, and yet spots still sit empty and nothing is getting done. So I’ve decided I’m going to do the only thing I know to do to get involved where these hidden rules can’t get in the way: I’m going to run for city council. I’ll be at city hall first thing in the morning on May 22 with a $20 check in hand. I live in Ward 3, and council member Bellows, with your term expiring, I think the people that live here deserve someone who cares about what they think, understands what the word transparency means, and knows how to treat people with respect and dignity. This is something I’ve been considering for the last few months, but the events of the April 23 council meeting made it crystal clear that now is the time to step forward. I hope to see more people stepping forward—more women, more people of color, and more people who don’t feel like they’ve been fairly represented. Run for city council, run for mayor, keep applying for these committees, keep showing up to these meetings—we can’t stop coming to these. And now is the time for all of us to do something. Council member Fernandez told FOX9 News that this was a small political brushfire, but he’s wrong. It’s not about him, it’s not about politics. There is a fire, but it has to do with us. It started when we voted Mayor Halverson into office, and we just passed the bond referendum, and we’ve packed this room—there are no chairs, this is awesome!—and we need to keep doing this because we’re ready for change. Wendy Berry is facing off in a primary on Aug. 14, 2018 with three other candidates. You can learn more about voting in West St. Paul, check out Wendy’s site, and see why I’m voting for Wendy.